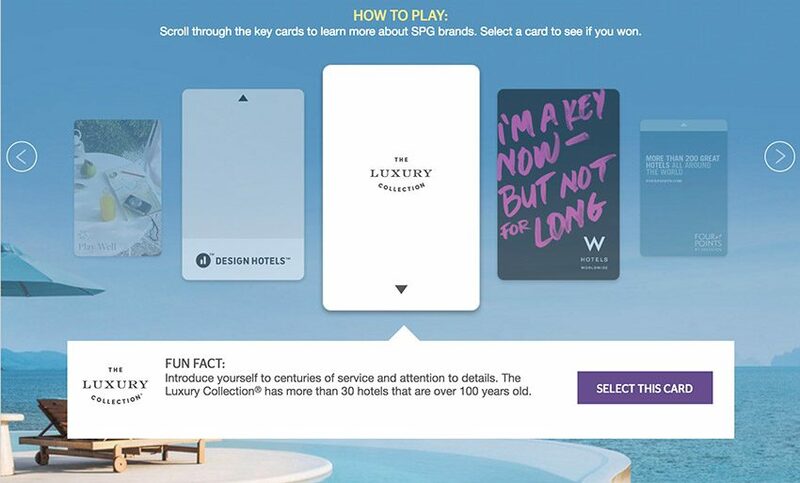 Starwood Preferred Guest is currently running the SPG Open More game, where you can win daily prizes of 1000, 5000 or 10,000 Starpoints or a free night. You can play once every day until the end of the contest, September 12, 2016. There is no cost to play and no purchase or booking is necessary. Upon logging in you will be offered with a carousel of eleven Starwood hotel-brand key cards, from which the participant will have to select one. Then, the game will declare if the chosen card is an instant win. After one play, the game will come to an end. You can look forward to clinch the grand prize of five Free Night Awards and 50,000 Starpoints, with an approximate value of USD 2230. Go to the SPG promos page to play the game everyday. Full contest terms & conditions are here. This entry was posted on Monday, August 29th, 2016 at 5:24 pm and is filed under News. You can follow any responses to this entry through the RSS 2.0 feed. You can leave a response, or trackback from your own site.